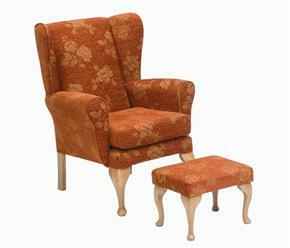 Queen Anne Fireside Chair Represents Fantastic Value. The Queen Anne fireside represents fantastic value for anyone who wants to make sitting a pleasure not a problem. Designed with the elderly in mind, the Restwell Range offers fireside elegance with excellent head, neck and lumbar support. With soft, inviting seats and back cushions they have been designed for hours of comfortable relaxation. Hand built hard wood frame is beautifully compact and is ideal where space is at a premium. The chairs are available in Sage, Gold, Terracotta and Rose colour fabrics. The high back and elegant padded wings provide extra support, comfort and protection against draughts for the head neck and shoulders.